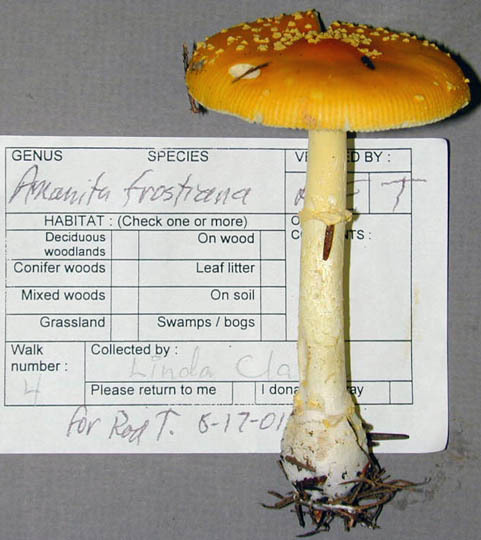 intro Amanita frostiana is a rather small species of the eastern U.S.A. and southeastern Canada—extending as far north as boreal forest on the Island of Newfoundland. 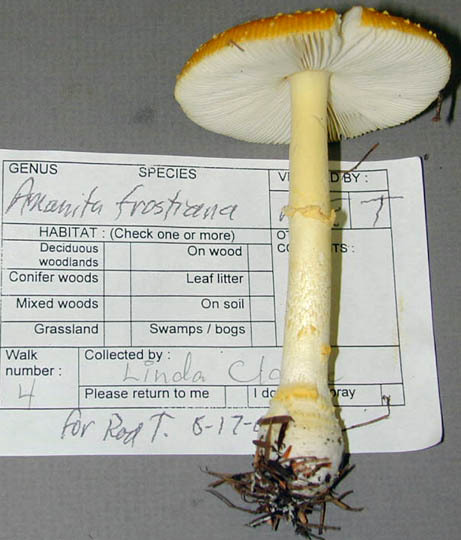 With the exception of some localities, it is not commonly encountered; and the great majority of supposed collections of the present species are found to be wrongly determined material of Amanita flavoconia G. F. Atk. The latter species has ellipsoid, amyloid spores and no persistent collar of volval material at the top of the bulb. cap The cap of A. frostiana is a yellow-orange or orange-yellow with the disc sometimes more red-orange than the rest and has a striate margin. The volva is distributed over the "20 - 80 mm" wide cap in yellow, friable warts. gills The gills are free, close, and cream in mass. The short gills are truncate to excavated-truncate and plentiful. stem The white stipe is "47- 62 × 4 - 11" mm (according to Jenkins' type study (1977), 94 × 6 mm in my only annotated collection) and bears a persistent ring. 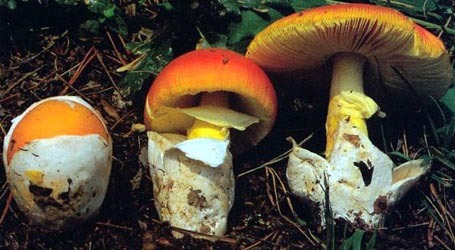 The distinct and starkly white bulb (e.g., 17 × 15 mm) bears a white or yellow-white collar that is somewhat similar to the collar seen in the exannulate Amanita albocreata G. F. Atk. 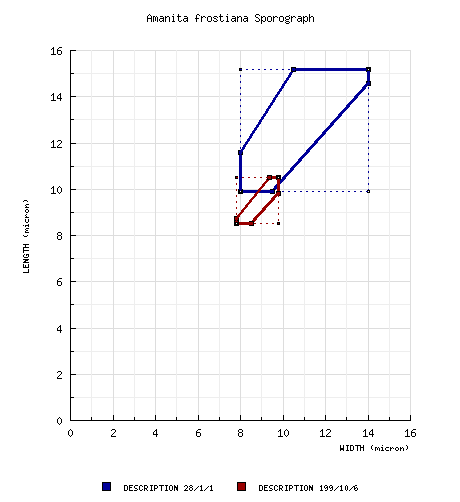 spores The spores measure (7.5-) 8.5 - 10.5 (-12.5) × (7.5-) 7.8 - 9.8 (-11.3) µm and are globose to subglobose (rarely broadly ellipsoid) and inamyloid. Clamps are present at bases of basidia. discussion This species is found in mixed forests with oaks (Quercus) and conifers (Pinaceae). A very similar eastern Asian species is A. subfrostiana Zhu L. Yang. R. Heim reported A. frostiana from Thailand; however, his material is much more likely to have represented A. rubrovolvata S. Imai, a species lacking in clamps and, hence, not closely related to the present taxon. author (Peck) Sacc. 1887. Syll. Fung. 5: 14. ≡Agaricus muscarius var. minor Peck nom. inval. 1870 ["1869," "1872"]. Rep. (Annual) Regents Univ. State New York State Cab. Nat. Hist. 23: 69.
non Agaricus muscarius var. minor Gray. 1821 (September). Nat. Arrang. Brit. Pl. 1: 600. ≡Agaricus frostianus Peck. 1880. Rep. (Annual) New York State Mus. Nat. Hist. 33: 44. ≡Venenarius frostianus (Peck) Murrill. 1913. Mycologia 5: 76. ≡Amanitaria frostiana (Peck) E.-J. Gilbert. 1940. Iconogr. Mycol. (Milan) 27, suppl. (1): 76, tab. 11 (figs. 1-2). non Amanita frostiana sensu Coker. 1917. J. Elisha Mitchell Scient. Soc. 33(1/2): 65. =Amanita macrospora H. L. Stewart & Grund. 1974. Canad. J. Bot. 52: 333, figs. 1-8, 28.
etymology Frost + -ana, suffix indicating possession; hence, "of Frost"
neotypifications Jenkins. 1977. Biblioth. Mycol. 57: 36.
type studies Agaricus muscarius var. minor—Jenkins. 1977. Biblioth. Mycol. 57: 92. Agaricus muscarius var. minor—Jenkins. 1978a. Mycotaxon 7: 34.
revisions Jenkins. 1977. Biblioth. Mycol. 57: 35.
intro The field may contain magenta text presenting data from a type study and/or revision of other original material cited in the protolog of the present taxon. Macroscopic descriptions in magenta are a combination of data from the protolog and additional observations made on the exiccata during revision of the cited original material. The following material not directly from the protolog of the present taxon and not cited as the work of Dr. Z. L. Yang or another researcher is based upon original research by R. E. Tulloss. pileus 54 mm wide, yellow orange, deeper orange over disk, planoconvex with decurved margin, tacky; context pale, cream near lamellae, yellow to pale yellow elsewhere except yellow orange under pileipellis, 6 mm thick at stipe, thinning evenly for about three quarters of radius, then membranous to margin; margin tuberculate striate (0.25R), nonappendiculate; universal veil yellow, small dissociating warts, pulverulent, minutely fibrillose (lens), detersile, not changing when cut or bruised. lamellae free, without decurrent line on stipe, close, some crenulate, cream in mass, very pale cream to subtranslucent in side view, 8.5 mm broad, unchanging when cut or bruised; lamellulae truncate to excavate-truncate, plentiful. stipe 94 × 6 mm, yellow except white just above the bulb, narrowing upward, then flaring at apex, finely pulverulent above, fibrillose to fibrous below, faintly longitudinally striate, unchanging when bruised; context cream, unchanging when bruised or cut, stuffed becoming hollow, with central cylinder 2 mm wide; bulb 17 × 15 mm, subglobose, somewhat flattened below; partial veil thin, membranous, yellow, sometimes collapsing and falling to inferior position; universal veil in a yellowish collar about 1 mm high completely circling top of bulb. odor/taste Odorless. Taste not recorded. tests L-tyrosine test of tyrosinase: positive on stipe surface and in stipe context (only tissues tested). Syringaldazine test for laccase: negative on stipe surface and in context (only tissues tested). Test vouchers: Tulloss 8-16-85-B. lamella trama from type of A. macrospora: bilateral, divergent; clamps scattered. subhymenium from type of A. macrospora: pseudoparenchymatic (cellular). Spore data courtesy of Dr. Zhu-L. Yang: [199/10/6] (7.5-) 8.5 - 10.5 (-12.5) × (7.5-) 7.8 - 9.8 (-11.3) µm, (L = (8.5-) 9.0 - 9.6 µm; L’ = 9.2 µm; W = (8.1-) 8.5 - 9.2 µm; W’ = 8.7 µm; Q = 1.0 - 1.12 (-1.17); Q = (1.04-) 1.05 - 1.08; Q’ = 1.06), hyaline, colorless, smooth, thin-walled, inamyloid, globose to subglobose to occasionally broadly ellipsoid, at least somewhat adaxially flattened; apiculus sublateral, cylindric; contents not recorded; white in deposit. ecology Gregarious or solitary in duff. Newfoundland & Labrador: In boreal forest completely lacking Tsuga canadensis. New Hampshire: In mixed woods with T. canadensis and Pinus sp. New York: In mixed forest including T. canadensis. material examined from type study of Jenkins (1978a): U. S. A.: NEW YORK— Lewis Co. - Croghan, s.d. C. H. Peck s.n. (neotype, NYS). RET: CANADA: NEWFOUNDLAND & LABRADOR—Unkn. Co. - Isl. Newfoundland, Gros Morne Nat. Pk., lower Green Gardens Tr., 5.ix.2003 Dr. Andrus Voitk s.n. (in herb. Dr. A. Voitk; RET 370-5). NOVA SCOTIA—Kings Co. - Halfway River Rd., 27.ix.1966 H. Stewart 95 (holotype of A. macrospora, ACAD 10981). ONTARIO—unkn. Co. - Port Dover [42.7863° N/ 80.198° W, 180m], 26.vi.2013 Eva Skific s.n. [mushroomobserver #137721] (RET 543-6, nrITS seq'd. ), 6.vii.2013 E. Skific s.n. [mushroomobserver #138881] (RET 547-2, nrITS seq'd.). U.S.A.: CONNECTICUT—Litchfield Co. - Washington Twp., N of Washington Depot, Bee Brook Pk., 25.vii.1992 Jackie Agnew s.n. [Tulloss 7-25-92-E] (RET 064-5). Windham Co. - Natchaug St. For., 31.viii.1997 Susan Hopkins s.n. [Tulloss 8-31-97-J] (RET 269-5). MAINE—Cumberland Co. - Cumberland Center, 20-25.vii.1984 S. S. Ristich s.n. [Tulloss 7-20/25-84-SSR] (RET 238-1), 28.vii.1984 S. S. Ristich s.n. [Tulloss 7-28-84-SSR-B] (RET 238-3). Oxford Co. - unkn. loc., 2.vii.2012 James Veitch s.n. [mushroomobserver #99919] (RET 508-7). Washington Co. - Grand Lake Stream, Wabassus Lake [45.1572° N/ 67.8436° W, 87 m], 4.vii.2013 Teresa Clements s.n. [mushroomobserver #138672 (RET 546-2, nrITS seq'd.). MASSACHUSETTS—Essex Co. - Boxford St. For., Peter Fechko, Rob Moir & R. E. Tulloss [Tulloss] 9-6-90-C (HKAS; RET 009-3). Unkn. Co. - unkn. loc., NEMF86 foray #15, 16.viii.1986 R. Youst s.n. [Tulloss 8-16-86-A] (RET 138-6). Unkn. Co. - unkn. loc., NEMF2001 foray #4, 17.viii.2001 Linda Clarke s.n. [Tulloss 8-17-01-A] (RET 362-1). NEW HAMPSHIRE—Hillsborough Co. - SPNHF land, Swamp Rd., 18.viii.1989 Joe Kuczinski s.n. [Tulloss 8-18-89-A] (RET 246-9). NEW YORK—Otswego Co. - Milford St. For., 16.viii.1985 R. Harlow s.n. [Tulloss 8-16-85-B] (RET 101-2). Oneida Co. - unkn. loc., 14.viii.2013 Eric Smith s.n. [mushrooomobserver #142718] (RET 588-6). Unkn. Co. - unkn. loc., 2013 E. Smith s.n. (RET 588-2, nrITS seq'd.). VERMONT—Bennington Co. - ca. Bennington, Bennington Fish Culture Stn. [42°51'10" N/ 73°10'12" W, 288 m], 24.viii.1980 R. E. Tulloss & M. A. King [Tulloss 8-24-80-A] (RET 392-6). photo RET - (1) Milford State Forest, Otswego County, New York, U.S.A.
(2-3) NEMF2001 foray #4, Massachusetts, U.S.A.
provisionally identified as: Amanita frostiana (Peck) Sacc. select a collection to review/add spore measurements..#717306. #ENDFONT OLIVEFONT, CANADA, NOVA SCOTIA, #717312. Teresa Clements, #s.n.=>mushroomobserver # 138672#717319. unkn. loc., 2013, E. Smith, #s.n., U.S.A., NEW YORK, Unkn...#732706. R. E. Tulloss & M. A. King, #s.n.=>Tulloss 8-24-80-A, U.S.A., VERMONT, ..#732724. unkn. loc., 2013, E. Smith, #s.n., U.S.A., NEW YORK, Unkn...#732736. Teresa Clements, #s.n.=>mushroomobserver # 138672#732737. Boxford St. For., Peter Fechko, Rob Moir & R. E. Tulloss, #s.n.=>Tullos..#732738. R. Youst, #s.n.=>Tulloss 8-16-86-A, U.S.A., MASSACHUSETTS, Unkn. Co., u..#732739. Linda Clarke, #s.n.=>Tulloss 8-17-01-A, U.S.A., MASSACHUSETTS, Unkn. Co..#732740. Joe Kuczinski, #s.n.=>Tulloss 8-18-89-A, U.S.A., NEW HAMPSHIRE, Hillsbo..#732741. R. Harlow, #s.n.=>Tulloss 8-16-85-B, U.S.A., NEW YORK, Otswego Co., Mil..#732750. Jackie Agnew, #s.n.=>Tulloss 7-25-92-E, U.S.A., CONNECTICUT, Litchfield..#737563. Eric Smith, #s.n.=>mushrooomobserver # 142718#740671. Teresa Clements, #s.n.=>mushroomobserver # 138672#740697. unkn. loc., 2013, E. Smith, #s.n., U.S.A., NEW YORK, Unkn...#742818. Eva Skific, #s.n.=>mushroomobserver # 137721#742819. E. Skific, #s.n.=>mushroomobserver # 138881#742825. Teresa Clements, #s.n.=>mushroomobserver # 138672#742833. R. E. Tulloss & M. A. King, #s.n.=>Tulloss 8-24-80-A, U.S.A., VERMONT, ..#782578. C. H. Peck, #s.n., U.S.A., NEW YORK, Lewis Co., Croghan, #782579. Dr. Andrus Voitk, #s.n., CANADA, NEWFOUNDLAND & LABRADOR, Unkn. Co., I..#782580. H. Stewart, #95, CANADA, NOVA SCOTIA, Kings Co., Halfway River Road#782581. Eva Skific, #s.n.=>mushroomobserver # 137721#782582. E. Skific, #s.n.=>mushroomobserver # 138881#782583. Jackie Agnew, #s.n.=>Tulloss 7-25-92-E, U.S.A., CONNECTICUT, Litchfield..#782584. Susan Hopkins, #s.n.=>Tulloss 8-31-97-J, U.S.A., CONNECTICUT, Windham C..#782585. S. S. Ristich, #s.n.=>Tulloss 7-20/25-84-SSR, U.S.A., MAINE, Cumberland..#782586. S. S. Ristich, #s.n.=>Tulloss 7-28-84-SSR-B, U.S.A., MAINE, Cumberland ..#782587. James Veitch, #s.n.=>mushroomobserver # 99919#782588. Teresa Clements, #s.n.=>mushroomobserver # 138672#782589. Boxford St. For., Peter Fechko, Rob Moir & R. E. Tulloss, #s.n.=>Tullos..#782590. R. Youst, #s.n.=>Tulloss 8-16-86-A, U.S.A., MASSACHUSETTS, Unkn. Co., u..#782591. Linda Clarke, #s.n.=>Tulloss 8-17-01-A, U.S.A., MASSACHUSETTS, Unkn. Co..#782592. Joe Kuczinski, #s.n.=>Tulloss 8-18-89-A, U.S.A., NEW HAMPSHIRE, Hillsbo..#782593. R. Harlow, #s.n.=>Tulloss 8-16-85-B, U.S.A., NEW YORK, Otswego Co., Mil..#782594. Eric Smith, #s.n.=>mushrooomobserver # 142718#782595. unkn. loc., 2013 E. Smith, #s.n., U.S.A., NEW YORK, Unkn. ..#782596. R. E. Tulloss & M. A. King, #s.n.=>Tulloss 8-24-80-A, U.S.A., VERMONT, ..